There can be little doubt that Karl Benz was the first to produce the petrol-engined car. Karl Benz started his engineering career making stationary engines running primarily on coal gas but soon realised the possibilities for mechanical personal transport. Benz pioneered the 4-stroke, 954cc single-cylinder engine and fitted it to a 3-wheeled “car”. Benz’s engine ran at a sedentary 400rpm and produced a grand 0.75bhp. For comparison DeDion Bouton’s engine ran at over twice the speed but Benz favoured a slower engine as it was less likely to shake itself apart. Benz’s 3-wheeler, the first petrol-powered motor vehicle was finished in Autumn 1885 and featured a tiller steering system. Benz had attempted to engineer a system to steer two front wheels but was unsuccessful, and was forced to wait until the Ackermann system was developed only a couple of years later. The 3-wheeler Benz was an innovative first attempt at a motorcar but sadly this innovation was not backed up with particularly strong sales figures as people had yet to come to terms with the idea of the horseless carriage. However, progress in this era was rapid and the first 4-wheeler came in 1893 and featured an enlarged engine now displacing 1745cc which produced a heady 3bhp and by the turn of the century this engine platform had been developed to displace almost 3 litres. This car, or more accurately this chassis template was named the Viktoria and was intended to be versatile enough for a large range of uses from 6-seater limousines to delivery vans and buses. However, it was the more compact, cheaper Velo launched in 1894 that solidified Benz as the premier motorcar manufacturer of the age. The Velo was the sales success the company needed. Sales of the Velo in 1900 outstripped the total sales of all vintage Benz cars sold before, with 603 Velos sold that year. With his cars now significantly outperforming the competition Karl Benz saw little need to change the design formula and his cars quickly became outdated as the industry caught up and by 1902 Benz sold only 206 cars. To rectify the problem Benz brought in new engineers headed by Hans Nibel who set to work on a 4-cylinder motor with 2 valves per cylinder and by 1908 Nibel had designed what was to be the template for the next series of successful Benz vehicles. Nibel’s cars were conventional machines featuring either chain or shaft drive which appealed to more conservative buyers as other manufacturers began to experiment with more diverse methods of propulsion. The vintage Benz we have in stock at The Classic Motor Hub is one of those built on Nibel’s successful design. So versatile was Nibel’s impressive engine that Benz offered it in 25 different variations and sizes. The 25/45 was built between 1909 and 1912 and the in-line 4-cylinder engine had an enormous displacement of 6.3 litres fed by an improved spraying nozzle carburettor developed by Benz. 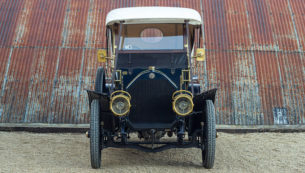 In October 1909 the car was delivered new to its first owner Ing Otto Krause who lived in Buenos Aires. Ing Krause came from a wealthy family who ran the main shipping lines between Buenos Aires and Patagonia. The Krause family owned the car until 1961 when it was discovered in a barn on the Krause family farm by a collector named Jorge Parodi. The car had been used on the farm as a work vehicle, having had the body removed and engine and chassis most likely used as a motorised cart. Parodi purchased the car from the family but did little with it, seemingly unable to find a body for the car. In 1983 Parodi sold the car to another collector called Carlos Pujol who started a comprehensive restoration on the chassis and engine. Señor Pujol owned the car for 15 years but was unsuccessful in finding a body for the car and grew tired of the search and so sold the car to our client in 1998. For six years our client searched South America for an original Benz body and fortunately had more success than the previous two owners, finding an original Benz body built by A Vendrine et Cie of Courbevoie, Paris. The restoration was completed in 2004 and since then the car has participated in several local rallies in South America, notably winning its class in the Autoclasica concours in 2012. This vintage Benz 20/45 is now in impeccable condition and ready to be enjoyed by the next vintage motoring enthusiast.